1) Ursun’s Teeth is the second novel in the Ambassador series, how do you foresee the series continuing? GM: Without giving anything away, I don’t actually see myself coming back to continuing the Ambassador series in the foreseeable future. They were pretty much always planned as a stand-alone pair of books, but just in case I ever did plan to continue it, I deliberately left parts of the ending a little vague so that I hadn’t shut the door completely behind me. And you never know, I may decide I want to go back and tell the tales of Kaspar’s earlier exploits in the armies of the Empire. Never say never, eh? 2) How would you define your work? GM: I guess as gritty dark fantasy. The architect Mies van der Rohe said that ‘God is in the details’ and I think that’s especially true in fantasy writing, so I try and tell them as stories that are set in fantastical realms, but have enough of a grounding in reality that make it easy for the reader to quickly get a handle on what you’re writing about. Though they’re set in fantasy realms, I want the reader to feel what’s happening as though they might experience it too, smelling the blood and smoke and tasting the grit in their throat as they ride alongside the characters. I want them to feel that, though what’s happening in the story may involve wizards and monsters and all manner of fantasy elements, it feels ‘believable’. 3) If someone was in a bookshop that you were in and considering your work against someone else’s, how would you persuade them to try yours over the other author? GM: I’d tell them the other book was crap and that their life would be made more fulfilling by reading mine. No, actually it would depend on whether or not I liked the other author’s work. I try not to be too critical of other people’s work (unless I really don’t like it – step forward ******* ***** <name removed on the grounds of not exposing more people to him>) because, you know, “people in glass houses…” and all that. I guess I’d say that mine were pretty dark and that if they wanted to read something with a rollicking good plot with plenty of action, choose mine. 4) How would you say that your work differs from other authors? GM: I’m not sure, to be honest. I don’t consciously write to be different from other authors, but try to find the most appropriate ‘voice’ to tell the story in. I’ve a very strong grounding in the universes of both 40K and Warhammer and, working in the Design Studio, its good to be involved in what we’re going to be making in the future, I can seed ideas and reference work that hasn’t yet been published, so I reckon I can link my work more easily and completely into our worlds than perhaps others can. 5) What influences you in your work? GM: Loads of different things. Books, movies, music, and things I see in daily life or, in one case, even a particularly vivid and disturbingly cool dream I had. The lyrics from a Slayer song inspired a character in Nightbringer and a chance remark from a friend gave rise to Guardsman Hawke, one of my, and other people’s, favourite characters in Storm of Iron. I take influences from pretty much everything I see. For example, while driving back to Scotland one time, I saw a tanker go past me with a single word written on it, which, after a little thought, gave me an idea for a whole novel. I won’t tell you what that word was, because that would spoil the surprise. You’ll just have to wait and see. 6) If you could re-write someone else’s novel in the same genre as yours, whose would it be and why? GM: That’s a tricky one, because most of the books I’ve read in the same genre of mine, I’ve really liked. One of my favourite authors is David Gemmell and while I’d never re-write any of his books – they’re amongst the best heroic fantasy around in my opinion – the epilogues always used to infuriate me, where characters we’d come to know and love were cruelly killed in a paragraph-sized finish. Now that I’ve written my own books and have a better appreciation for the why of books, I understand them and like them, but at the time…man, they made me mad. 7) When you sit down and write do you know how the story will end or do you just let the pen take you? GM: Pretty much I always know where I’m going. I usually start with an ending I like and try to work backwards from there, sketching out scenes that might lead to that conclusion. I always work from a chapter-by-chapter breakdown of the book, because I need that ‘roadmap’ of the book in order to get it written. And while that tells me what happens in the book, frequently it doesn’t tell me how it happens, because I think that if you plan too much detail early on, you straightjacket yourself into those ideas and don’t allow yourself any creative freedom as the story progresses. I have to give the plot and characters room to breathe in the telling and let the story begin to unfold by itself, to take on a life of its own. Most of my best ideas, characters or twists have come out of the writing and not the synopsis. 8) What do you do to put yourself in the mood to write? 9) What do you do to relax and who’s books have you read recently? GM: I have an unhealthily large DVD collection and love watching a good movie (or even a bad one if it’s really cheesy) or heading to the cinema. I get out with friends a lot and that’s a great way of relaxing for me. That and playing different types of games; board games, console games, role-playing games and wargames all help me chill out. And sleeping. Lots of sleeping. As for reading, that’s relaxing for me too. The last couple of books I read were by G.K Chesterton, The Man who was Thursday and The Napoleon of Notting Hill. Written about a hundred years ago, I can highly recommend both for their sly wit and sheer inventiveness of character. I loved them and encourage anyone who reads this to dig them out. Previous to that I read, Michael Shaara’s book, The Killer Angels, a historical fiction account of the battle of Gettysburg. Again, I can heartily recommend this book. 10) How do you respond to feedback and how do you respond to negative input? GM: As long as feedback is useful, both negative and positive critique is always very important. Positive feedback is always nice, because it affirms that you’re doing something right and that people dig your stuff. Negative feedback, if it’s done constructively, is also useful because it allows me to see what I’m doing wrong so that I don’t do it again and therefore improve my writing and storytelling skills. I absorb all comments from people and will give them their day in court. Some I’ll agree with and others I won’t, but you have to accept that not everybody is going to like your stuff and deal with it. In the end, I always write for myself, writing things I think would be cool and that I’d like to read – that’s all you can do really. 11) What advice would you give to other would be authors? GM: Read, read, read. Write, write, write. And repeat. The best piece of advice I can think of is simply to write as much as you can. Writing is a skill like any other; the more you do it, the better at it you become. Read as many books of as many different styles as you can and just get writing! Get regular feedback from people whose opinions you trust so that you can get some truly honest feedback. Don’t be too precious about your work while at the same time be willing to fight your corner if you think you’re right. 12) What project follows on from Ursun’s Teeth and what can you tell us about it? 13) When you’ve had a novel published have you been able to pick it up and reread the finished product, or is there something in you that still wants to add bits or change others? GM: Not really, I’m a bit of a perfectionist at times and I try not to hand over anything that I’m not completely happy with, so, barring any actual errors, I’m never normally tempted to add or change anything in the work I’ve done. Having said that, my first draft of Nightbringer was way over the projected word count and I had to cut nearly 25,000 words from it. Parts of the story were therefore heavily shortened and some nice, characterful bits had to go, so that one, yeah, maybe a ‘director’s cut’ of the novel would be nice. Just for my own sake though, because I think the edited version is a much tighter, more focused novel. 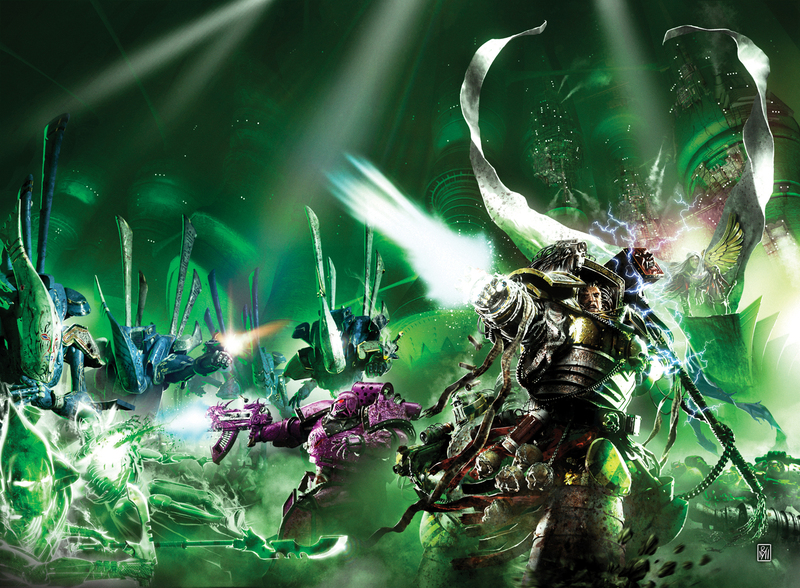 14) When you’ve written a novel for the Black Library have you ever thought to see any of your creations as figures in the Games Workshop range? If so, whom would you like to see envisioned in metal? GM: I’ve already built a few models based on the books myself. I’ve done dioramas of Uriel facing off against the Nightbringer and one of Captain Eshara from Storm of Iron fighting the daemon Warsmith. I’ve been planning one of Uriel about to be munched by a Carnifex for ages, but haven’t had the time to actually make it. I’ve seen a lot of people’s conversions of Honsou from Storm of Iron and they’ve all been pretty cool, but if there was one to be made by the Games Workshop miniatures designers, I think I’d pick Kaspar von Velten, probably because of Paul Dainton’s stunning artwork on The Ambassador and Ursun’s Teeth.